Once again I rode the back of the Beast offensive formation into the playoffs, but this time, we rode into the KYA Bantam “A” Super Bowl Championship. 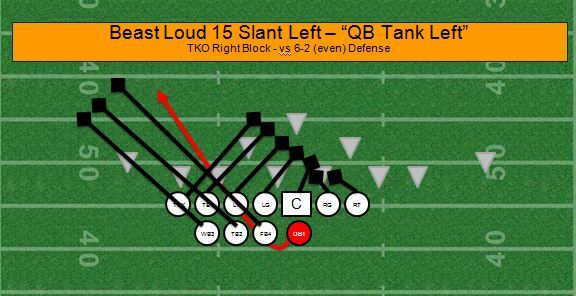 My favorite Beast formation play is the Beast Tight Loud Tank off tackle play. This almost embarrassingly simple play accounted for a 98 yard TD run and a 50 yard TD run during our Championship games. I must confess I started running this play in 1994 after seeing it on a Apple football computer game called Playmaker. I ran several simulations on the game back in 1994 and it always gained 4 to 5 yards, so I started running the Beast formation with my 8 year old Plano TX football team, the Hurricanes. At the time, I did not know what the formation was called. We just called it Loud, Rowdy and Monkey, for Left, Right and Middle. If you look at the football play closely, it is really an off-tackle wedge trap play. The play side Offensive line blocks down in a severe angle block and the running backs push the line man on take off and block out at severe angles creating a trap like effect on the DT or DE. The defense gets confused because of the number of personnel at the point of attack and it is hard to see the running back pop through the hole. So if you love running the Wedge, then this play should fit nicely in your play book, because if the defense stacks the middle to defend the Middle Wedge, run the Beast Tank off tackle football play. can you run a beast right tank formation using two tight ends. plus have the left tight end go in motion to the right side to have more power for the run. you cant have a tight end go in motion but one of your wing backs can go in motion if you set him up on opposite side.